As per section 3 and 4 of Real Estate (Regulation & Development) Act, 2016 (REDA) read-with Rule 3 of above rules, no promoter/developer can sell, advertise, market, book or otherwise without getting the project registered with the RERA authority of Rajasthan. 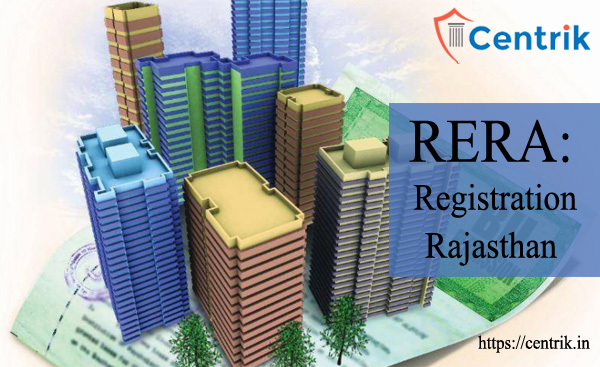 The application for registration of such Real Estate Project shall be made in writing along-with declaration, as prescribed in Rules, in triplicate. 25 per square meter for projects where the area of land proposed to be developed exceeds 1000 square meters, with maximum Cap of Rs. 10 Lakh. 5 per Square meter, but shall not be more than Rs. 2 lakh. Authenticated copy of the PAN card of the promoter. Audited balance sheet of promoter for preceding financial year. Income tax Returns of the promoter for 3 preceding financial years. The number of open parking areas available in the real estate project. Authenticated copy of the legal title deed reflecting the title of the promoter to the land on which development of project is proposed along with legally valid documents for chain of title with authentication of such title. Details of encumbrances on the land on which development of project is proposed including details of any rights, title, interest, dues, litigation and name of party. Where the promoter is not the owner of the land on which development of project is proposed details of the consent of the owner of the land along with a copy of the collaboration agreement, development agreement, joint development agreement or any other agreement, as the case may be, entered into between the promoter and such owner and copies of title and other documents reflecting the title of such owner on the land on which project is proposed to be developed. Name, photograph, contact details and address of the promoter if it is an individual and the name, photograph, contact details and address of the chairman, partners, directors, as the case may be, and the authorized person in case of other entities. the particulars in respect of Architecture and Design Standards, Type of Construction Technology, Earthquake Resistant Measures and the like to be adopted for Buildings and for Common Areas and of amenities / facilities in the Layout Plan of the real estate project. the nature of the organization of allottees to be constituted and to which the title of such land parcels is to be conveyed and the specific local laws to govern such organization of allottees on completion of real estate project. Any other information and documents as may be specified. The validation of registration shall be till completion of project as given by the promoter. The registration can be extended as per the prescribed rules.